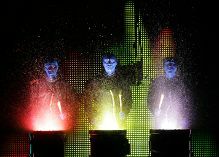 Blue Man Group Review | Blue Man Group - NYC - Exciting, Unqiue and FUN! Valid for regular orch/mezz tickets. Not valid for premium or poncho seats. Subject to availability. Excludes Saturday performances and holiday blackouts. The Blue Man Group is a very unique and exhilarating ride through all of your senses. They elude to the idea that this somewhat creepy blue skinned, white eyed trio are somehow genetically morphed with many issues including a shinny, very realistic skin of blue. They perform soft, three stooges style physical comedy using an array of lights, multi-media effects, colors, percussion instruments, PVC pipes and even huge amounts of toilet paper. Once seated you can see how the show immediately begins to interact with the audience. They have a mouse scroll board – where my wife immediately noticed that they had ME on the board through a series of fun poking scrolls encouraging me to stand and be recognized by the curious audience. They had several of these bits and another very fun bit was a horned character with a large watch interrupting the show to announce a late arrival. The couple got a bright spot light along with the “late alert” alarm. All in good fun. The show opens up with silhouettes of the group on media screens drumming – they are excellent drummers and have several “instruments” they perform on. Once they emerge the light-color show begins with members pouring bright yellow, red and green paint on the top of the under lite drums creating a very cool special effect of colorful splashes flying through the air. Now, we know why the first 10 rows are provided complimentary ponchos. They continue through an array of silent skits involving drumming, colors, flying orange jello and on several occasions ventured out into the audience with their bright white eyes scanning the nervous patrons for “volunteers”. They certainly “sold” their characters nary an expression on their blank stares. I thought the use of lighting was great – from black lights to strobe lights – each created a different perspective on not only the group but the stage. The stage band were seated above stage right with neon face paint the only visual so you really couldn't discern what instruments they were playing only streaks of neon. Pretty cool. One of their props were three giant iphones where they are able to click on “apps” that modify their appearance when they duck behind the phone and appear on the screen – it is a neat trick that they had a lot of fun with and was very entertaining. They use the phones through out the performance for some really cool special effects and multi-media support. Towards the end of the show there suddenly was streams of paper towels/thick toilet paper coming from the back and being pulled forward by the audience until the entire room as covered and paper was pouring from the balcony – again silly, but fun. The Blue Man Group is a great ride and I would definitely recommend it for all ages!